Here she comes now saying 'money money'...Shoot 'em down, turn around, come on money! Sh'up! I know! I went to high school! I typed money because, well, the picture is of.....MONEY! Show me what a Mony looks like and I'll post a pic of that. But, mony is a suffix, (hegemony, alimony, etc) and there are no pics of suffixes. So nyah! He's credited with pulling the US out of the great depression with his 'New Deal'. (he didn't. the groundwork for the recovery was laid before he was elected, but he got credit for it) He's the reason there is now a term limit for the presidency. And, of course, he's on the dime. But, have you ever wondered why? Of all the presidents, why Roosevelt? At the time, only Lincoln, Jefferson and Washington had been depicted on a coin. So, why FDR? Most people, when asked, will say it was a tribute to the newly fallen president. He had done so much for the country, and it was a fitting tribute to him. Most people, of course, would be wrong. Roosevelt wasn't really a very good person. He was a typical politician. He did what he needed to do to get re-elected. At the time, his New Deal was quite unpopular. History has glossed over the downsides, but it didn't do as much for the country as a lot of people think it did. It did, however, get a lot of already rich people richer, while putting poor people to work and keeping them poor. He was a notorious horn-dog. His seemingly happy marriage to Eleanor was a sham. The didn't really like each other too much. But, what do you expect of cousins? Roosevelt was more fond of his secretaries than of his wife. There are several theories, (not all crack pot, either, but some are fairly credible), that FDR schemed with Churchill to get the US into the war in the pacific. England needed help there, and the US wanted territory. It's almost certain that FDR knew the attack on Pearl Harbor was coming. (in his defense, there wasn't really much he could do about it). He also lied to the public. For his entire term, he denied there was anything wrong with him. In reality, he had polio. It's common knowledge now, but back then, not a lot of people knew. FDR and his people went to great lengths to hide that fact from the public. He feared, (probably correctly), that no one would vote for a cripple for president. I'm not going to be too harsh on him for the polio bit, though. I mean, it's not like anyone would be surprised to find out a politician was lying, right? Besides, the fact that he had polio is just about the main reason he's on the dime. FDR had polio. It left his legs weak. In the early 30's, he could walk well enough, but he got tired easily. By the end of his term, when he died, he was pretty much confined to a wheel chair. But, he needed to exercise his legs to keep any mobility he had left. So he swam. FDR loved to swim. In fact, there are a great many pictures of him swimming, because being in the water made it easy to hide the fact that his legs weren't strong. Swimming was one of the most common therapies doctors prescribed for people with polio. But, there weren't a whole heck of a lot of places where people with polio could swim out side of rehabilitation centers, or specialized spas. Both of which were expensive. So, in 1937, FDR was talking about how he wished he could come up with a way to work with the National Foundation for Infantile Paralysis to build pools for polio sufferers. It just so happened that his friend, Eddie Cantor, was in the room. Cantor was a vaudeville star, and he suggested to FDR that he use one of his fireside chats to encourage children to send him a dime to help build the pools. FDR thought that was a good idea. And so did the children of America. They responded with gusto. Remember, America was emerging from the depression at this time. People remembered what it was like to need something, and after all, it was just a dime. So, dimes were sent to Roosevelt. At it's peak, he was receiving 15,000 dimes a week. All the dimes were given to the NFIP for building pools, and eventually, so many dimes were coming in that people were told to send it to the NFIP directly. And the dimes just kept coming. Kids were getting organized. They were holding events at school to collect dimes to send it. And it all started from that one idea to ask people to send in a dime. Cantor not only came up with the idea for the dimes, but he also came up with a name for the program. He took the name of a popular news reel and slightly tweaked it. That news reel was called 'The March of Time', and the program was called, 'The March of Dimes'. That dime program was so successful that people started associating The March of Dimes with the NFIP. So, in 1976 the NFIP changed their name to 'March of Dimes Birth Defects Foundation', and in 2007 changed it again to 'March of Dimes Foundation'. 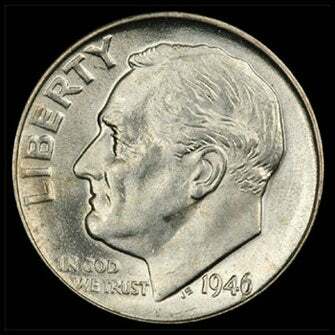 But in the late 30's and early 40's so many dimes were sent in that, when a fitting tribute was sought to remember Roosevelt after his death, what better honor than to put his face on the dime. And, if you think about it, it is rather fitting. He was responsible for so many dimes being donated, after all.